On this article there is a picture. Which is worth a thousand words. Coming to a mobile/cell near you. 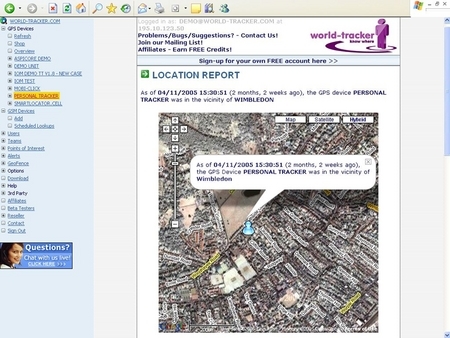 The text says "as of 04/11/2005 15:30:51 (2 months, 2 weeks ago), the GPS Device PERSONAL TRACKER was in the vicinity of Wimbledon"
Still, technology marches on. If you ask us, the real future is in *massively parallel peer-to-peer* elves. Take FLEET ONLINE. This Dutch business-oriented service was introduced a month ago to the UK. It's a pay-as-you-go site that lets companies instantly locate their employees' mobile phones, to a granularity of the nearest cell (ie 50m in urban areas). Positioning costs 25p a shot. Here's the real gimmick, though: you can sign up yourself, and then add any mobile phone you'd like to be geolocated. Oh sure, your victim will get an initial "Do you want to be tracked?" opt-in message, and then another in two weeks. But think of all the phones you can get physical access to long enough to say yes to that original text. Friends! Spouses! Potential stalking fodder! And what you could do in two weeks. Supposing you're a burgling elf: you could nick that phone, sign it up, give it back, find out where they live via the geolocator. And then *find out when they're out*! It's a RISKS Digest all of its own!